Growing up in the 60s we always had Siamese cats, seals as I recall; the earliest was Ming Soo and we had her for a good number of years, with at least one litter of kittens. She was the classic type, and my favorite kitten of hers was a girl I called Kitty (yes, how original, but I was only six or seven then!) Anyway, I never had to call her by name as she would come running when I whistled for her, just as we did for the dog. 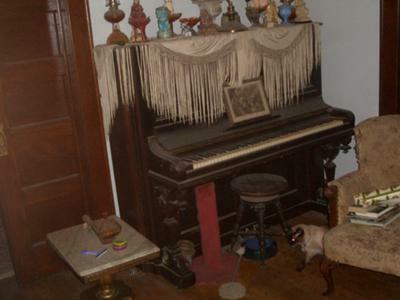 About twenty-five years later, I moved into Columbus from the country and a neighbor told me about a Siamese he couldn't take in due to having two cats and a dog already. Since it was October, I took the cat - a lilac point, covered in oil, skeletally thin and scared of loud noises. According to the vet he was six or seven years old, and I had him for another fifteen years until he died of kidney failure. By that time Kublai was going deaf, was blind and beginning to show signs of senility as he'd walk in circles until being picked up, then he would be okay again. My sister gave me Genghis, a seal point kitten whose mother had been tossed out at her farm. At three months, he needed ear mite meds, eye drops and sinus medication, but in a short time he became healthy and loving. When Genghis was about eight months old my sister brought me his sister, Bortai, as the remaining kitten of the litter had been killed. 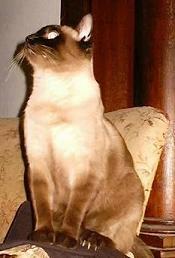 Bortai was a seal-tortie point. It was tough sleeping with both of them, as one would lay on either side of my pillow, their heads cupped in my hands and their tails facing my head! Genghis would adjust his head to suit my position, but Bortai placed my hand where she wanted it by indicating with her paws - a habit she still has to this day! Alas, Genghis was stolen six years ago late one August evening. He was a robust, expensive looking boy at twelve pounds, as Bortai is for a girl weighing in at ten pounds. My sister then found me another kitten to help keep Bortai company - Chula, a classic seal point weighing about seven pounds, with a thin but not elongated body and a slightly more pointed muzzle than my other cats had. In all these years, since moving into Columbus, my Siamese have all been lovable, friendly and playful, but not overly vocal. 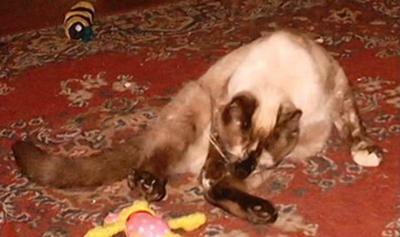 I remember growing up to loud Siamese voices, but all I get 99% of the time from Bortai and Chula are purrs. I guess I'm doing things right! Thanks so much for your story, Marlin! My aunt once had a cat called Chula. What lovely names you had for all your cats - yes, even Kitty! I was so sorry to hear that Genghis was stolen though - it's heart-breaking when something like that happens, both for the humans and I think for the other cats, and it's great that you were able to get another Siamese cat to keep Bortai company. She and Chula sound very happy together and I hope they're with you for a long time yet. Tonya, who I call 'Princess' is such a laid-back girl. :) She is not my cat, But lives with us and her master. Thanks Caroline--it took Bortai quite a few months to return to normal--she hunted for her brother all over the house, and became much more 'social' not wanting to be far from me. I never mentioned his name around her, as it would upset her when I had been hunting the neighborhood for him--in conjunction with flyers, newspaper ads and a search on foot all over the area, with no success. Kublai, the lilac point, when he was around sixteen, was out in the yard with me and my tuxedo Elspeth when I saw another cat coming into the yard--I knew Elspeth would probably chase after the stranger, so I grabbed her first and put her inside, and immediately came out to see Kublai going around the corner of the house in hot pursuit! That suited Elspeth since she liked going for walks, but Kublai decided to stay inside for the most part. Since Bortai and Genghis had been outside their first few months, neither ever showed any interest in being outside. A blind cat isn't really a problem, just don't move furniture around, and keep their food and box where it usually is. Kublai had no problem finding his way around the house and could find me by a soft meow which I always answered. Thank you for your story, it was really interesting. You are lucky, you have escaped the traditional Siamese howl when they are in season or stressed. My 14-year-old Seal Point boy Lucifer, who is almost blind, a little deaf and has a bit of arthritis in the rear still howls and screams when he can't find my little Seal Point girl Madina. They are inseparable even though she is only a year and half old.